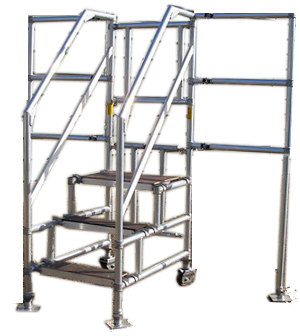 The an innovative, simple, safe and versatile solution for working at height with haulage vehicles and loads. No more struggling and back injuries whilst hand-bailing loads on and off trucks. No more dropped and damaged goods. Single operator can pick and unload/load up multi-item non-palletted deliveries or loads. Stow-away in small busy yards. Access where forklifts cannot operate. Pushes up to rear or side of vehicle for loading/offloading - minimising vehicle manoeuvring where space or time is an issue. Foldaway design can be easily carried on vehicle. manufactured to the same high spec as our Podium Step products. Choice of models to suite application. The unit is designed and built with various options including rear access with side wings and locking gate, 1500mm wide rear access lorry podium, dual height rear access, full width lorry podiums and side access lorry podium with locking gate. Side load Lorry Podium Coming Soon.